Cytoscape has the ability to associate a Nested Network with any node. A nested network is any other network currently defined in Cytoscape. This capability allows for creation of network hierarchies as well as circular relationships. For example, various module-finding plugins make use of nested networks in the overview network that they generate. There each node representing a module contains a nested network. Note that Nested Networks are similar in concept to Groups, but with very different consequences. A Nested Network incorporates an independent network that does not share nodes or attributes with the current network – it can be edited only as a separate network collection or in a separate Cytoscape session. 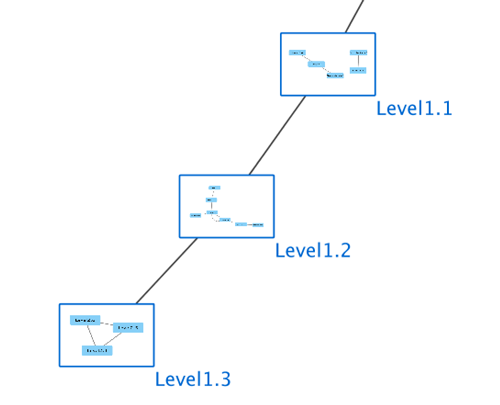 Its nodes cannot be connected to nodes in the current network and cannot be found or filtered using Cytoscape functions or apps. Conversely, nodes in a Group are part of the current network, can have edges to nodes outside of the group, and can be found or filtered using Cytoscape functions or apps. Most often, Groups are more functional and easier to use. There are currently two ways in which a user can create nested networks. By importing a Nested Network Format (NNF) file. (See: NNF Network Format). By manually constructing networks and assigning nested networks to individual nodes through the right-click node context menu. (See Nested Network Node Context Menu). Nodes containing nested networks that are zoomed in sufficiently display an image for the nested network. If no current network view exists for the nested network the image will be a default icon, otherwise it will be a low-resolution rendering of the nested network’s current layout.